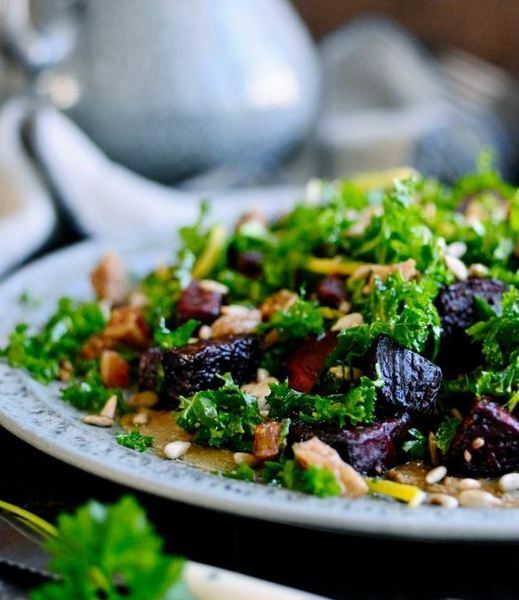 The sweet flavors of tender roasted beets on top of crisp greens make this center piece salad an absolute favorite. I first tried roasted beets when my husband Scott roasted them in olive oil and garlic on the grill. They quickly became a weekly addition to our family dinners. Beets are packed with surprising health benefits and are often listed as one of the world’s healthiest foods. These beauties are full of iron, copper, magnesium, and potassium. As good as beets are for you to eat, they’re also stunning additions to your plate. Besides, growing your own beets basically means you have two crops from one garden—beet greens are equally tasty as the root and are terrific raw, braised or stir-fried. 1. Remove the tops and roots of the beets, and peel each one with a vegetable peeler. Cut the beets in ½ inch chunks. 2. Place the cut beets on a baking sheet, and toss with the olive oil, garlic, salt and pepper. Roast for 35-40 minutes, turning once or twice until the beets are tender. Remove from the oven and immediately toss with the orange juice. 3. Sprinkle with salt and pepper, and place on top of your favorite mixture of leafy greens. Top with balsamic vinegar and remaining olive oil. Toss and serve warm. January 09, 2018 by Corinne L.